When CVS moved into the old Appletree Market building at Santa Monica Avenue and Bacon Street, it was with great fanfare – and an equal amount of worry around the community as to whether the store would be a positive for Ocean Beach. Store officials had to give a presentation to the Ocean Beach Town Council and agree to a number of stipulations laid out in a community agreement in order to get approval for the store. Town Council President Gretchen Newsom recently sent a copy of the stipulations – in checklist form – to the CVS to see where they stand on progress. While the checklist is still going through the proper red-tape channels of CVS’ corporate offices, local store manager Steve Usrey went through each of the 50-plus bullet points, telling me they have achieved just about every one of them. Usrey said he understands the concerns from the community, having grown up in San Diego and visiting OB throughout his youth. Usrey said he understood some of the major reservations from the community – liquor sales, hiring local employees, parking and keeping the area clean – and has tried to go above and beyond to be a good neighbor. First, the building itself. CVS agreed to keep the structure of the building. “Appletree Mural” – He said they have no plans to paint over the “Appletree” mural on the side of the building, although CVS has deferred to the Town Council on the mural’s future. Limit on Alcohol Sales – The agreement also stipulates that no more than 5 percent of store sales can be from liquor, something which Usrey says they are happy to comply. He said they put security caps on all their liquor bottles and don’t sell any individual servings of beer, wine or liquor. They also train all cashiers how to spot someone who has been overserved and to not sell alcohol to anyone who might be a problem. Hire Local – Usrey also proudly says a majority of the store’s 14 employees are from the area. Landscaping and Parking Lot – The outside area has been landscaped and parking lot repaved. On a recent Wednesday evening, a “Lot Full” sign was posted. Usrey said they contract out the lot, but reserve 20 percent of the parking for customers. Parking is free for up to two hours, but they do monitor to make sure nobody abuses the policy. “We don’t want to tie the parking up, but if we don’t manage it, we won’t have any place for my customers to shop,” Usrey explained. He paints a rosy picture of the store’s first few months. But that’s not to say it’s been all smooth sailing. There have been problems with homeless people trashing the area and even the bathroom. After letting anyone use the store bathroom, Usrey had to restrict it to only customers after a number of messes were left. They also had to deal with someone pouring syrup all over some blankets and leaving them outside. Other than that, Usrey says he has gotten positive reviews both in person and from websites like Yelp. Competitors like the Rite-Aid just a few blocks away? Newsom said the Town Council will report on the store’s progress at this month’s meeting – April 22nd at the Masonic Center. Usrey seems pretty confident it will be a positive one. Based on the empty parking lot day after day, this must be the worst performing store in the chain. The service at Rite Aid I find awesome. And I have waited in line there like twice in eight years. I could take or leave CVS or Rite Aid, my favorite was Longs. No doubt OB needs at least one pharmacy. 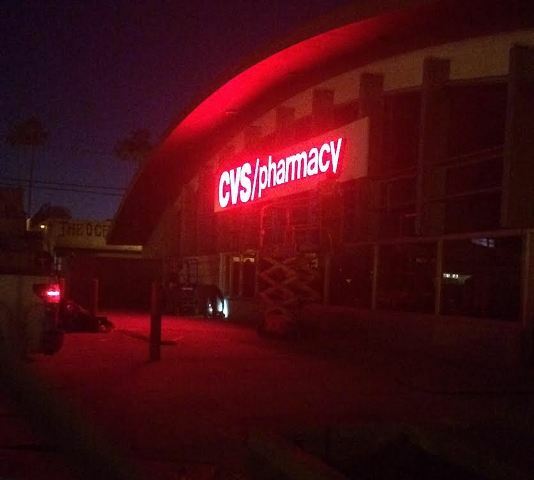 Kudos to CVS….the building is gorgeous. Thank you for retaining its charm. Rite Aid is like an old friend….you don’t want to loose it. Both have good people work for them. If OB can have tons of bars, no doubt it can handle 2 pharmacies. Maybe the parking lot is not full because residents are walking to this store??? How part of the agreement didn’t include fresh produce or a real food section is amazing. They have these items in NYC and east coast stores.. 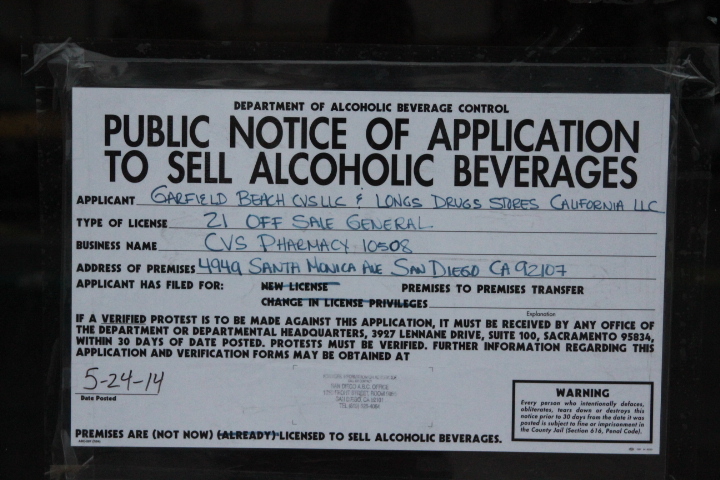 Someone must have been paid off to overlook the fact that OB is now a food desert. Is it just a poor choice of words that the manager said, “This is kind of why my boss stuck me in this store.” And, “I had my reservations about getting quality people.” (from the locals hired). I hope so. You are putting word into the managers mouth with “(from the locals hired)”. When I did entry level hiring ( I interviewed thousands and hired hundreds over the course of 20 years) the reality is that hiring quality people at the wages offered is always a challenge. Even more so when you are being artificially limited in the scope of where you can hire from geographically. Christo, my use of parentheses is just to show what he was implying as a referral back to that paragraph, not what he said verbatim. Just to clarify, he was referring to the fact that nobody really wanted a CVS when they talked about moving here. So he felt had to work to get the neighborhood behind them. Yeah…I do know that. Covered the whole thing for the Reader at the time. Interesting to hear the varying opinions on Rite-Aid. I have had numerous experiences with unacceptably long lines and a lack of help when trying to find items. CVS is going after those shortcomings with an added focus on customer service in their store. Hopefully that will lead to Rite-Aid stepping up their game as well. I like the CVS a lot better than the Rite Aid. There are no lines and the prices are the same for the most part. I think the lot being open for use is also a big plus for OB. Hopefully the Apple Tree people open the store on Newport and keep it clean this time. The old Apple Tree was nasty.